Our Owyang Ancestors, according to "The Big Book of Owyangs"
The segment of the tree that is linked to this page is from pages 134 and 135 of The Historical Data and Genealogical Table of The Owyang Family For Four Thousand Seven Hundred Years, published in Chinese around 1996, affectionately known among cousins as "The Big Book of Owyangs.". Sharon Wong Fong, whose mother's maiden name is Owyang, obtained this book from relatives in Dai Lian village, Zhongshan District, Guangdong Province, China, where the Owyang relatives originate. One of Sharon's relatives was shown our grandfather Hoon Owyang's (also known as Owyang Koon Cheung) Chinese characters, and managed to find his name in this book! Just the fact that someone has been keeping track of the Owyangs over so many generations is quite amazing. Unfortunately, the scan doesn't capture all of the characters and text very well, so I'll be happy to send you a copy. Just e-mail Grant. If you look at the upper right part of the tree, you will see the name Owyang See Mon. That is Owyang Koon Cheung's great-great grandfather, or Nicholas, Sarah, Brittany, Graham, Riki, Roni, Jeffrey, Daniel, Kristin, Matthew, Christopher, Kelsey, Michael, Kiyoshi, and Charlene's great-great-great-great grandfather! Owyang See Mon had four sons, one of whom was Owyang Quock Ying. Quock Ying had a son, Owyang E Joe, who had a son named Owyang Yue Bow, who had three sons, Koon Cheung, Ng Cheung, and Kwong Cheung. The chart says Koon Cheung had five daughters and three sons. The sons are listed as Yung Son (evidently the son who was born in 1918 and died in 1919), Dung Son (Uncle Bill), and Gee Sung (Uncle John). The daughters are Yuet Oay (Aunt Mary), Yuet Ying (Aunt Louise), Yuet Fong (Aunt Margaret), Yuet Mui (Aunt Esther), and Yuet Lan. Yuet Lan is evidently the daughter of Owyang Koon Cheung (Hoon Owyang)'s second wife, whose maiden name was Hong. If you follow down the tree under Dung Son (Uncle Bill), you will see two sons listed, Hawk Ling (Terry) and Way Hung (Doug). Unfortunately, Renée is not included, since she is not an Owyang any more, by marriage. 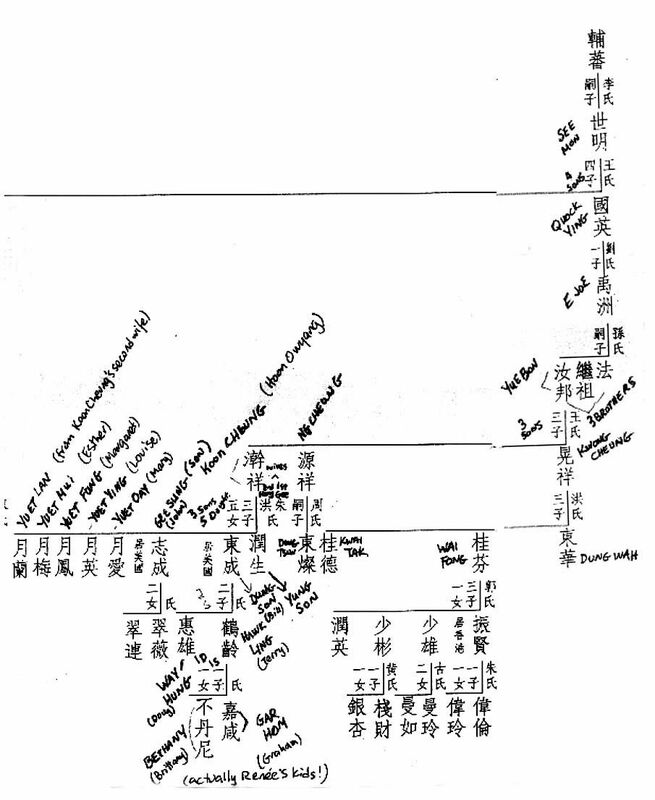 Her children are listed, however, as the children of Hawk Ling (Terry), whose characters on the chart can be phoneticized as Bethany (Brittany) and Gar Hom (Graham)! Evidently, someone in Dai Liang village got part of the correct information! The tree also shows descendants of Owyang Koon Cheung's brothers, Ng Cheung and Kwong Cheung. Ng Cheung appears to have had one child, Dung Tsin. Kwong Cheung had three children, Kwai Tak, Wai Fong, and Dung Wah. Dung Wah was the paper son who Koon Cheung brought over in 1919. In 2004, Owyangs who had roots in the Sacramento River delta area (including the towns of Locke, Courtland, Isleton, Rio Vista, Walnut Grove, etc.) gathered for a reunion organized by Sharon Wong Fong. Many were from the Dai Lian branch of the family, and others came from ancestors who lived in the town of Mah Jee. Over 200 people attended, and got to view annotated copies of pages of the Big Book, translated by our fifth cousin Michael Ho. He traced several lines of Owyang family members, many members of which were in attendance. Because of Michael's work, we are now able to trace our ancestors 24 generations ago, to Owyang Yung Ko, who is believed to have been the first Owyang who settled in Dai Lian!